This place is for the birds! And we love it that way. Hit the trail and other hot spots to visit with our feathered friends. The Audubon Bird Sanctuary on Dauphin Island. The upper Mobile-Tensaw Delta is one of the most diverse places on planet Earth. Many endangered and rare species live here and only here. With a thriving habitat comes an amazing array of birds. From coastal and migratory birds that are common to the Gulf coast to the beautiful river-loving upper Delta birds such as ducks, geese, eagles and more. Spanish Fort’s 5 Rivers Delta Resource Center is not only a mecca for amazing bird watching and Coastal wildlife viewing, but it’s another stop on the Alabama Coastal Birding Trail. Sitting at the mouth of five rivers and overlooking the Mobile-Tensaw Delta, this amazing Center showcases the wonders of one of the most diverse ecosystems on Earth. Equally as impressive is Weeks Bay Estuary Research Center and the nearby Pitcher Plant Bog, where you can sit back and watch birds of all varieties enjoy the pristine, un-touched beauty, but you can also see one of the rarest plants on Earth. The Alabama Coastal BirdFest, a birding and nature festival showcases great bird- and nature-watching spots all around Baldwin and Mobile counties. It includes workshops and a free bird and Conservation Expo. BirdFest is a great adventure no matter your level of birding experience. There are four stops along the Alabama Coastal Birding Trail that are ideal for riverside birdwatching and getting up close and personal with nature. Learn about the plants, wildlife, ecology, and history found throughout the beautiful 6,816-acre Bon Secour National Wildlife Refuge, part of the U.S. Wildlife Refuge System. Guided tours and walks are available year-round, and The Refuge is always open to the public for free. The refuge serves as a resting and feeding area for migratory birds and as a sanctuary for native flora and fauna. The refuge is one of the largest undeveloped parcels of land on the Alabama coast. 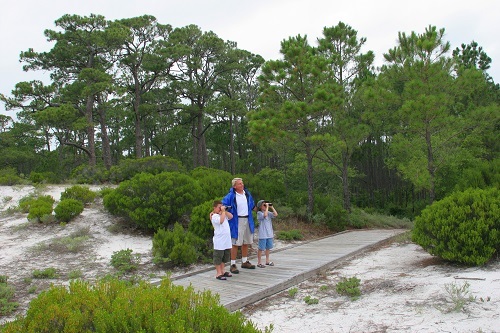 The Hugh S. Branyon Backcountry Trail, which winds through the Gulf State Park from Gulf Shores to Orange Beach, offers equally amazing bird watching year-round. Eagles, egrets and other raptors–as well as herons, pelicans and many species of song birds—abound along the 28-mile paved trail system that offers dozens of benches, swings and picnic areas to enjoy the view. The Trail includes 6 distinct ecosystems and is a designated U.S.A. National Recreational Trail.